“Stop Vision Loss Now” by Bruce Fife, ND, is concisely written in a manner that the reader does not need to have an advanced degree in science to be able to understand. The reader is first given an explanation about the different parts of the eye, and how vision works. The author offers a comprehensive discussion about eye disorders. This covers everything from common visual problems such as cataracts, glaucoma, macular degeneration, and dry eye issues. Eye diseases brought on by other health issues such as diabetes or poor nutrition are also covered. Taking a holistic approach, the author discusses everything that one can do to aid their vision; this includes a low calorie ketone diet, exercise, supplementation, and the use of coconut products such as coconut oil and coconut water as a protocol in eye care. The material presented is heavily referenced which not only helps promote the credibility of the information presented, but it also gives the reader other resources which they can use for further research. I was really surprised to see coconut oil promoted for eye care. I have been learning about its use for other health related problems, but not for the eyes. The discussion about its benefits makes it easier to understand why it works to not only help prevent vision problems, but also reverse or heal the progression of an eye disease. What an incredibly easy way to do something to promote our visual health! 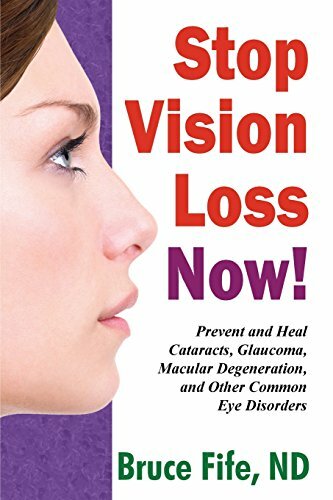 Readers who are facing issues with chronic, progressive eye diseases will really benefit from reading “Stop Vision Loss Now!” by Bruce Fife, ND. It is well worth reading, especially if it might help someone save their sight without surgery. I was surprised to discover several medications I take could contribute to eye disorders. I definitely plan on following up with the suggestions to see about improving my overall health and vision in my middle-aged eyes. I look forward to seeing if I can actually improve my vision.